Links in email should open app if installed. 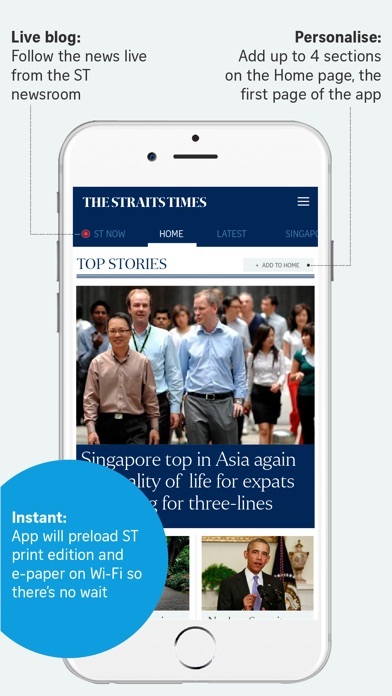 Links to Straits Times website in the daily email digests should launch in the ST app if installed. 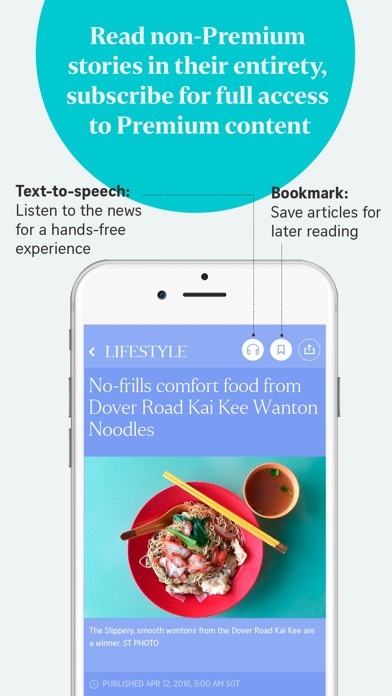 This app is serving up pop-up advertising at every opportunity, at startup, after every link, including video pop-ups. Very disruptive and irritating. Plus the video pop-ups are sucking up bandwidth, which occurs at every link. Very bad form for a respectable news org. Makes the app almost unusable, unless you have the patience to live with the nonsense. The latest build is so different (better) in form and style from all that has come before that it is hard to imagine it coming from the same team, or company. Whatever it is that you are doing, SPH, please keep at it. It's certainly in the right direction. The user interface is rich and intuitive. It is easy to navigate and a joy to use. 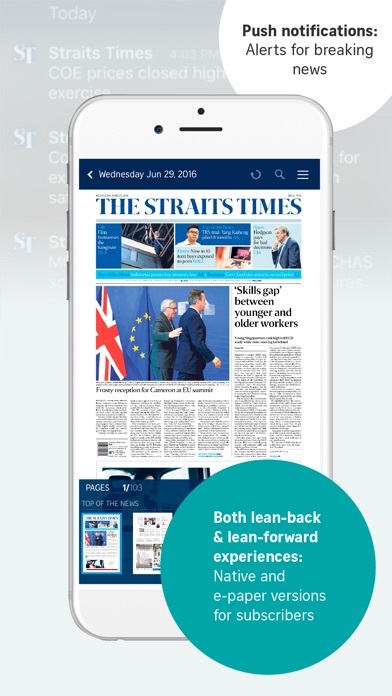 It is no longer a poor cousin of the print edition and can stand on its own as a complete Straits Times. While it is no FT or NYT, is comes very close; without mimicking or copying. Kudos to the development team. Now that the electronic version has caught up with the print edition, perhaps ST can set its ambitions higher and aim for a global readership, much like the FT or the NYT. With more op-ed, analyses and features that appeal to a globalized audience trying to understand Asia or the world through Asian eyes. Best of luck! iOS app Works great but Apple Watch app is not native and is usually a blank screen. 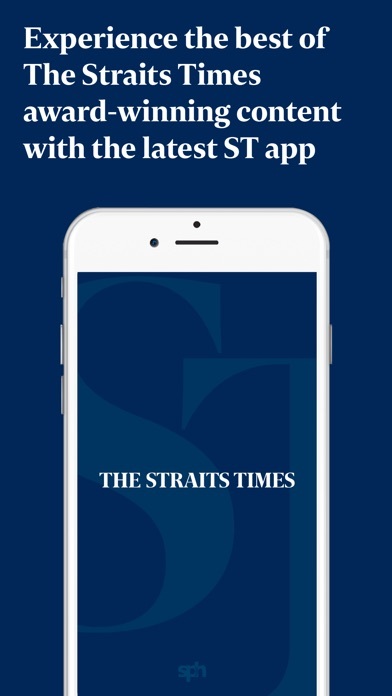 This latest version keeps crashing the moment I open the app--I can't even see the front page of the ST app before it collapses back to my iPhone home screen. Please fix! The system asks for a subscription to view the paper in pdf format when I have an ongoing subscription that covers that. This has happen countless times over the past few years when I had switched to online viewing rather than reading a physical paper. Please fix it. Once or twice is acceptable. Frequent periodic screw ups are not, especially for a national paper. Really great new design. Loads fast and is easy to navigate. Good work guys. Even though I have a subscription and am logged in, am told that I have no access to epaper. Have to logout and relogin again. Newspaper also doesn't load. I'm a ST subscriber. Everyday the app prompts me that I've read the limit for the month and I need to logout and login again just for me to read the article which I already paid for. Fix this.